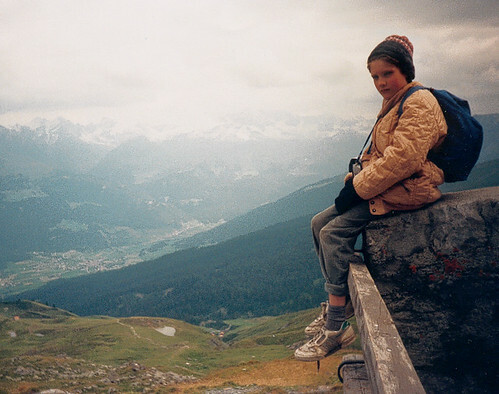 Random image: me at Zietal, the highest monastery in Europe (nr Savognin, Switzerland), age 10-ish. I was in a real strop that day, running off ahead and refusing to speak to mum and dad! Earthquakes really do give me the jeepers. I think the fact that I’m currently listening to Bill Bryson’s A Short History of Nearly Everything doesn’t help – in that he talks of the earthquakes that are way overdue in Japan, including the one centred on Tokyo which will no doubt see a lot of people killed and injured. It got me thinking though. I tend to have this idea that great cataclysmic events (ice ages, meteor strikes, earthquakes, volcano eruptions etc) are all in the past, a part of Earth’s history before it settled down and enabled the current eco-system to develop. But listening to Bryson reminds me that the Earth is no less active now than it ever has been. It still has a molten core that lets off steam now and then, it still has an atmosphere that’s changing in its composition (now more than ever of course), it still suffers from tectonic shifts. We’re still in this ‘historical era of cataclysmic events’ – it’s just one of those little quiet periods at the moment. I find this fact useful. It reminds me how important it is to live for today, and to not focus on how much ‘stuff’ I own. If our house comes down in rubble and goes up in smoke, the only thing that will be left is relationships with others (and a backup of my hard drive that I have permanently attached to my inner thigh, updated hourly by bluetooth). Ultimately, nothing else will matter but preserving life itself. And when life itself is finally extinguished, as it surely will be, there won’t even be relationships with others to get hung up about. Best not be overly obsessed with them either then. “Well, when the big one strikes most apartments will come down anyway, so I wouldn’t worry about that”. The two blessing we do have is that we have a park in front of us with a huge lake (useful in case of fire), and no buildings immediately to the east or south of us, thus reducing the risk of fire and giving us soft ground to jump on should we need to. In fact we’re kind of ideally situated, as the park compost heaps are directly below our balcony – perfect for soft landings. I do love being married. Things are really good. *Twinkle* is such a blessing in my life. As I write, iPhoto 09 – one of the applications contained in Apple’s brand new iLife suite – is trawling my collection of 30,000 photos searching for faces. It’s been at it for over 6 hours now, and apparently will take at least another 3 hours to pick everyone out. (That includes YOU if I’ve ever taken a photo of you!). It’ll then ask me to name people, and will ‘learn’ what people look like, the idea being that when I add new photos in the future, it will automatically identify whose in them, and apply the appropriate tags. These can be synced to and from facebook – clever huh? If someone out there tags a photo of me in Facebook, my photo library on my Macbook will be automatically updated to include it. The ability to group photos based on their location is also pretty nifty. If your camera is not GPS equipped, you can tag your images by searching for a place name, or by dropping a pin on the built-in Google Map. The place index is a bit too US-centered for my liking, with tonnes of results coming up for American cities, but only the ‘big places’ listed for other countries. No doubt that will change. Anyway, best get on. The earthquake has inspired me to look for an Earthquake app for the iPhone, which I now need to blog about.